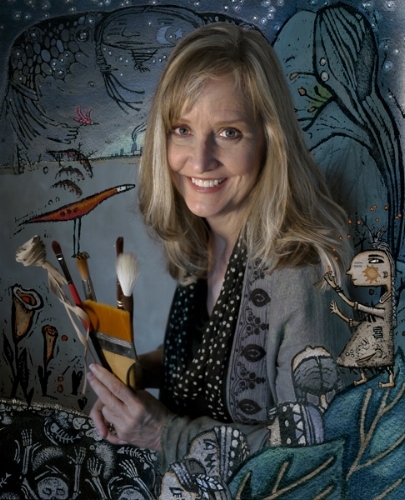 Terri Murphy is a children's book and media illustrator. She is also a part-time youth librarian where she develops Young Artists Workshops for area libraries. It's safe to say Terri lives in a world of children, art, and books. She didn't so much choose children's book illustration as a career as it chose her. When trying to explain to her young sons about their adoption, Terri decided to create a picture book for them. The project mushroomed until she found herself sending the story and book dummy to publishers. She caught one publisher's interest, and that's all it took. Terri was hooked! She now illustrates picture books, magazines, children's music cds, posters, and books for the educational market. She is known for her quirky style and rich color palette. When not illustrating or writing her own picture book stories, Terri can be found with her camera recording wildlife in nature and rock concert venues, or trying out imaginative vegetarian concoctions that arouse much suspicion in the kitchen. Her husband and children claim to have post-traumatic eggplant disorder. A girl reaches for her dreams atop the back of a donkey. Children taking their chances playing with a dragon. Animal, human, tree, all equal.